Hillary Lewis, Founder “gots” the squeeze on her juices! Tempted by the fruit of no other… but Lumi! It’s a refreshing month at simoneink as we have teamed up with Lumi Juice down in Charlottesville, VA, to proudly represent their cold pressed juice products. After a visit to their warehouse where we saw firsthand the dedication of this young female entrepreneur Hillary Lewis and her enthusiastic team, we knew right in that moment that there was a bright future ahead. 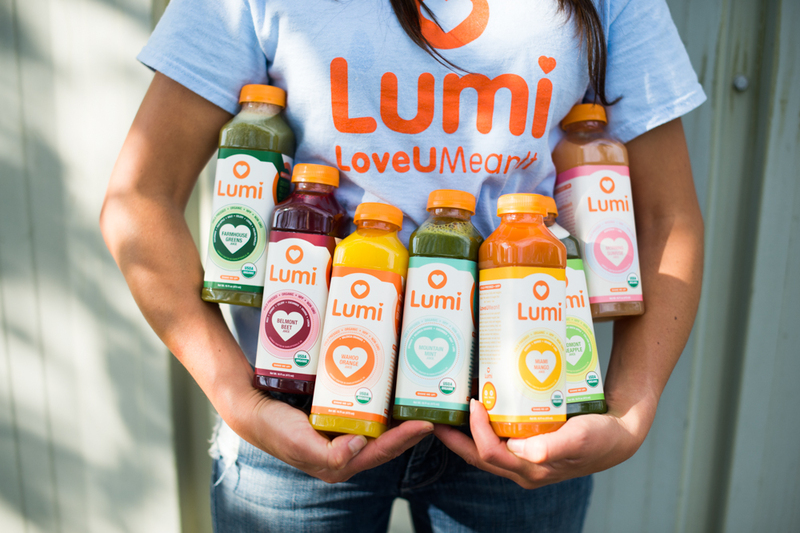 Lumi, which stands for “Love yoU, Mean It,” crafts organic, cold pressed, high pressure processed juices. When you crack that bright orange top you know it’s straight from the earth. 100% juice, 100% organic, 100% love! We run a fit and energetic office at simoneink, so now with Lumi in our lives we are stronger than ever! Seeing Hillary pave her own path as a smart, strong-willed entrepreneur is inspiring. Her enthusiasm brings to mind my own humble beginnings, when simoneink was a dream I willed into a wonderful reality. We are so excited to be working with this young woman who infuses her product and her business with vigor and love. Lumi brings a fresh, unique feel to the growing juice business, and we are ready to help Hillary take it to new heights. After only ten months in production, Lumi erupted onto the grocery market circuit by popular demand throughout nine states in the Mid-Atlantic region: at 54 Safeways, 41 Mid-Atlantic Whole Foods, and on New York City’s Fresh Direct online grocery delivery service. And on September 3, Lumi Juice burst into coolers at 160 Fresh Market stores nationwide, as the high-end chain’s exclusive cold pressed juice offering, which put it in 18 new states across the country. Lumi’s innovative small-batch line of pure organic fruit and vegetable juices is changing the way America drinks. Each 16oz. bottle contains a whopping two pounds of organic produce, cold pressed and high pressure treated to retain its flavor and nutritional integrity. Lumi starts with whole organic produce, which is then introduced to a hydraulic press that renders pure, matchless juice. This small-batch process mines the juice’s nutrients and flavor profiles to give it that all-natural zip only otherwise experienced from a whole fruit or vegetable. Lucky for us all, getting the Lumi love just got a whole lot more attainable! This entry was posted on September 16, 2014 by Simone in Hillary Lewis, Lumi, New Client and tagged Charlottesville, cold pressed juice, Hillary Lewis, Juice, Lumi Juice.